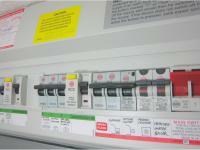 Our electrical services cover both the domestic and commercial sectors. Today, all new electrical wiring or electrical components for a house, flat or small commercial premises linked to domestic accommodation must be designed and installed in accordance with the new Part P of the Building Regulations. If you are planning to extend or alter the electrical installation in your home, even a small job like adding a new light in a bathroom requires notification to Building-Control (Part P) or use of an approved electrical contractor. This is where we can help. Our electrical work meets the current Wiring Regulations, and on completion, we issue a detailed certificate confirming the work meets with this safety standard and also where applicable, arrange for you to receive a Building Compliance Certificate. We cater for a variety of customers within the commercial field; from landlords and café owners, to those responsible for managing community centres, church halls or retail outlets. We always use good quality materials sourced from reputable wholesalers and will do our best to undertake work at a time convenient to you so that disruption is kept to a minimum. 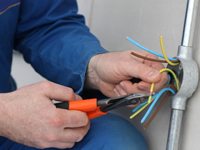 What’s more, on completion of the job we will provide you with an Electrical Installation Certificate or Minor Works Certificate confirming the work meets the current Wiring Regulations. Website design by Swansea graphic design company Graphic Core.